First off – happy holidays! I hope you survived, relaxed, and were mostly pain free. All in all, I’m happy to say that my holidays were pretty good. Compared to some of the flares I’ve had recently, I was rather pain free. As the new year approaches, I’ve been thinking about resolutions. Last year, being pretty new to my RA diagnosis, I was full of resolutions about how to keep my life and conquer RA. My resolutions were bold, but I’m happy to say I achieved a few big ones. I ran a marathon, I wrote a book, I donated 11 inches of hair that had been the same long style for nearly a decade. Perhaps the boldest thing I did in 2013 was admit to others outside my closest inner circle that I have RA. It may not sound like much, but that was scary and very liberating. It took some time, but it means that I’m now not ashamed to admit that I have RA. Sure, I’m not shouting it from the rooftops, but if you ask, I’ll talk to you about it; if it’s relevant, I’ll bring it up. So with all that progress, what are my goals for 2014? It just so happens that the resolutions are similar. I’d like to run a marathon, or at least a half marathon, in 2014. This time, it’s not because I want to prove RA can’t stop me, but because having that goal, doing those training runs, and crossing that finish line made me feel powerful. As I enter 2014 with far more symptoms than I thought I’d have at this point, empowerment is something I know that I need. If not a marathon, than perhaps a triathlon of some length. Either way, 2014 will mean choosing a race and training. I’d like to write another book. I’d like to do yoga more and learn how to meditate. I’d like to be even more bold and do the Run for Arthritis. I want to travel more. 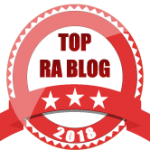 Most of all, I want – and let’s put it down in writing so that I remember – to not resign to RA, to pain, to drug regimens, or to feeling different or incapable. My rad life is about much more than all that. It’s about big goals and big dreams. Not because of, not in spite of, but just in order to live life to the fullest. And that’s what I plan to do. So cheers to an exciting, adventurous, big year. I wish all of you the best possible 2014.